Lady Tara Davidson was once one of the London season’s most brightly shining diamonds. Now she is one of its most titillating scandals. Furthermore, she believes that she has lost the love of her life, the man for whom she forfeited her reputation and marriage to a wealthy, highly connected man. Tara is feeling sorry for herself when things get even worse. Her profligate father has gambled away the small fortune he gained from his new son-in-law (The Bride Says No) and is heavily in debt. All his debts have been bought up by Breccan Campbell, the Beast of Aberfeld, who has demanded marriage to Tara in exchange. Leaving Tara little time to protest, her father has arranged for the wedding to take place in an hour. But Tara refuses to accept her fate. She reverts to type, disguises herself as a boy, and runs away. Breccan Campbell may be the powerful laird within his clan, but in the larger community, he is viewed as a big, dumb, graceless beast, the very opposite of his polished, gentlemanly cousin, Owen Campbell, and the last man expected to win the hand of an acclaimed beauty. But Breccan is far smarter and more determined than his critics can imagine. Fascinated by Tara from his first glimpse of her when she rode into his stables looking for Ruary Jamerson, he refuses to recognize obstacles. He is not only stirred by Tara’s beauty, but he also sees marriage to her as a way of assuring that his children will not share his awkwardness and become targets of mockery. When Tara runs away, he pursues her and persuades her to accept his bargain: marry him, give him a child or two, and he will fund her escape to London where she will be just another married woman living a life separate from her husband’s. And so the two are married. What comes next is predictable, of course. After all, this is romance. But the journey to the HEA is filled with conflict, machinations of those with evil intent, sage advice from loyal relatives, advances and retreats, and surprising sweetness. In other words, it is one fine story. I confess that I approached The Bride Says Maybe with some trepidation. I actively disliked Tara in the first Brides of Wishmore book, and I harbored doubts that she could be redeemed in my eyes. I should have trusted Cathy Maxwell. Not only did she reveal unexpected depths to Tara, but she also showed Tara’s growth into a person who truly loved and thus lost her self-centered modus operandi. To my surprise, I found Tara a sympathetic character, one whose HEA left me sighing blissfully. Breccan had me from the beginning. I love variations of the Beauty and the Beast tale, and gentle giants are among my favorite heroes. I particularly loved the heart of Breccan, the man he was behind his rough exterior, a man with dreams, intelligence, and an underlying morality. The fact that Tara came to appreciate all that he was and to love him devotedly certainly raised my estimation of her. There were so many things I loved about this book. I loved the conversations, sometimes beginning in contentiousness, that Tara and Breccan shared, conversations that resulted in revelations that allowed them to know one another beyond their preconceptions. I also loved the flashes of humor in this book. The incident with the broken bed and the erroneous conclusions left me laughing out loud, as did Tara’s relationship with Daphne, one of Breccan’s beloved dogs. The result was that I liked this book even better than the first one. So if, like me, after book one, you have reservations about the redemption of the heroine, know that Cathy Maxwell proves fully capable of transforming Lady Tara into a heroine readers will understand, like, and root for. If you did not read the first book, Maxwell gives enough of the backstory early on that The Bride Says Maybe can effortlessly be read as a standalone. For readers who love Beauty and the Beast stories, this one offers a new twist. For readers whose hearts beat faster when the hero is a Scotsman, Breccan is a delight. For readers who enjoy historical romance that evokes a few laughs, inspires ample sighs, and reminds that characters are not always what they seem, I think you will love this book as much as I did. Thanks for your review! I also loved this book, perhaps a wee bit more than THE BRIDE SAYS NO, for the same reasons you articulated - Tara grows up. How Tara and Breccan grow close (don't want to spoil it) was touching. And the dogs - loved them! Thanks, Janga! I did a lot of head nodding as I read your review. I agree with everything you said. Can't wait to see what Cathy Maxwell brings us next! Oh I really want to read this series - thanks for the review, it sounds wonderful!! It's well worth your time, catslady. Hope you enjoy it! Great review! Sound like a really great series! Great review, makes me want to skip everything and get going on my reading. I have her first book in this series, but haven't had a chance to read it yet. Needless to say, I rush out to my nearest bookstore and also bought her second one. They are sitting so nicely next to each other in my bookcase.....soon, very soon, I'm going to read these books. Hopefully before book number three, THE GROOM SAYS YES (I think) comes out...... LOL! I happen to enjoy any book by Cathy and I'm sure these will not disappoint me. Thank you for another informative review. Beauty and The Beast stories have always been my favorites. This sounds like one I need to read and will most certainly enjoy. 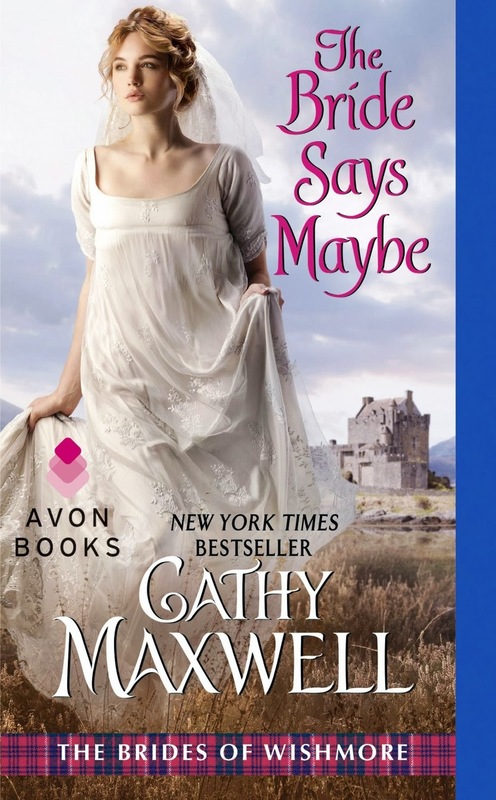 I enjoy Cathy Maxwell's books and will have to make sure I read all in this series. A great plot here, isn't it? Sounds like it's a down-to-earth and funny kind of book. I like that and am looking forward to reading it.